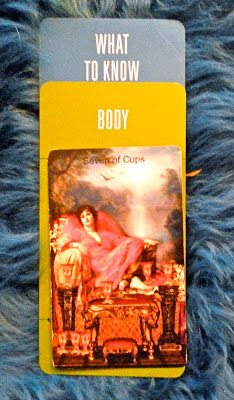 Today's Draw: Seven of Cups from Infinite Visions in the What Your Body Wants You to Know position from the Deck of 1000 Spreads. Do you listen to clues from your body, and do you act on them? Are you a good steward of the vessel your soul inhabits? What is your body trying to tell you? You could also read today's position pair as What to Know About Your Body. Or even What Your Body Needs to Know. However you interpret that, the answer is there are a lot of options available to you—just don't spend so much time mulling over your choices that you do nothing. I've written on this blog before about how I've struggled with my weight for most of my life. While I believe that cutting calories and exercising are really the only natural way to lose weight, there are so many possibilities within that, it's mind boggling. What calories do you cut? Fat? Carbs? Do you cut across the board? The right answer is different for different people. Then there's exercise. What kind of exercise should you do? What time of day? How long should you do it for? The options are endless. And no answers are wrong. But it's so easy—and convenient—to get into a situation where you think about it a lot and end up doing nothing. I know this because this is where I've been for years. I've basically told myself that anything I do won't be "enough". Meanwhile anything I do will be more than I'm doing now. Just looking at these cards, it seems to be saying "your body wants you to know you've become complacent and indifferent." And this can apply to my healthy friends, too. Let's say you're a jogger and you like jogging, but you're not getting the same results from it that you used to. You can vary the lengths of your runs and your venues. You can lengthen your stride. You can do something to shake yourself out of the routine and up the ante on your workouts. You have many options—just don't get so caught up in them that you just continue with the status quo. Let's face it. Very few of us will ever make all the right choices for our bodies. Likewise, very few of use will make all the wrong choices. What these cards want is for us to make conscious choices, as opposed to choosing through inaction, because that's a choice, too. And it's not just about diet and exercise. It's about anything you put into your body and anything you do with it, not to mention the vigilance you put into it through doctor visits and whatnot. Another element of this is that our bodies try to communicate with us all the time and we need to listen to that, too. My aches are my body's way of saying, "I need more flexibility and exercise." A craving for OJ, which I have now and again is my body asking for added vitamins. Everything from heartburn to loose stools is trying to steer you toward making a different choice. A lot of people in the spiritual world tend to have weight and/or health issues. There can be a lot of spiritual reasons—or excuses—for this. For example, some healers might take on some of the health issues of their clients over time. Or some might say holding extra weight is something people do when they otherwise have issues "grounding" themselves. I used the word "excuses" up above, because there are options to circumvent these issues...stronger boundaries, better protective measures, better spiritual techniques. But by not choosing those options, we choose the unhealthy option by default. We're not victim to our spiritual path. So I know this combo has come to tell me to "just do it". And to become a more conscious steward of this body. And maybe it's come to tell you something, too, whether you need big tweaks to the choices you make for your body or not. One thing I know from having a 30-year-old spirit trapped in a 70-year-old body at the age of 50 is that if I don't do something about this now, I'll drag my youthful spirit down with me. And I just have too much I need this body to do.